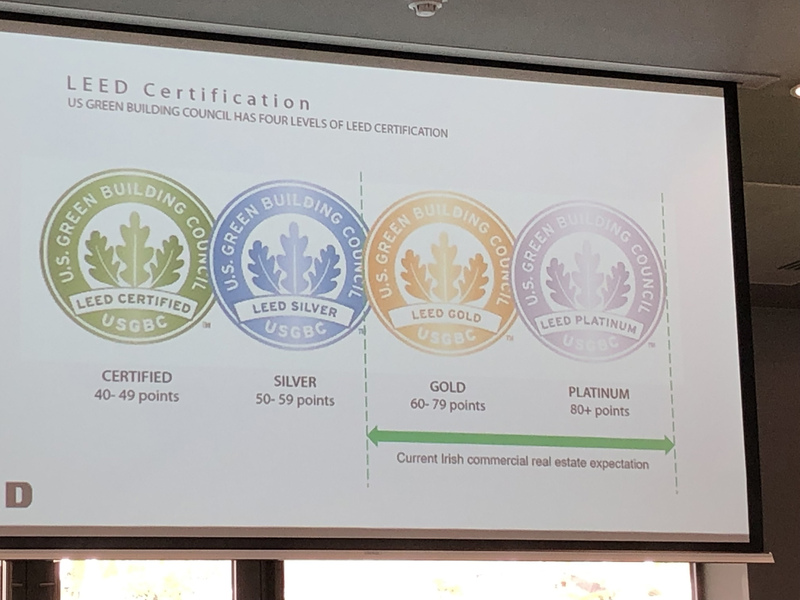 LEED Gold Office design was a central topic at the recent ‘Delivering Commercial NZEB’ conference in Pairc Ui Chaoimh, hosted by the Technical University of Dublin. – SBEM based NEAP software will determine whether the design will comply with the new Part L Building Regulations. 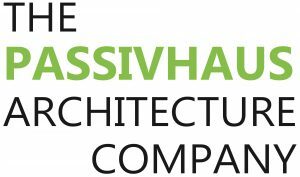 – this is a compliance only software, and is not to be confused with software that must be used to model the energy balance of the building. To do so would almost definitely produce a building that will overheat, or consume huge amounts of energy. The software is not capable of giving and actual design energy consumption. – Dynamic Building Simulation software must be used to design the building. IES has been referenced as potentially appropriate as part of the information that will be required. There are other specialist calculations around glazing design that may be beneficial, and others. LEED Gold is the standard of environmental performance that is becoming the norm in the Dublin market. 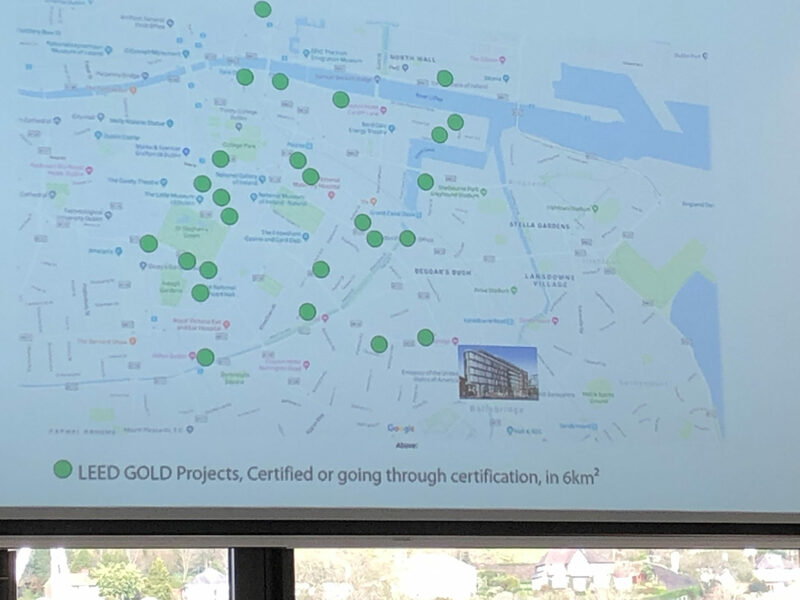 The map below shows the number of LEED Gold office buildings under construction at the moment in the Dublin City centre district. The presenter from RKD architects noted that they can see no market for office buildings below this standard, as this is what the companies expect as a minimum environmental performance. I would love to hear your comments and if you have any questions post them in the comments below and I will get back to you. Thank you for reading my blog on this issue and do share it using the buttons opposite! Also you can leave a comment or question below. You are invited to post your questions on this topic in the comment section at the end of the page and we will advise you as best we can…. 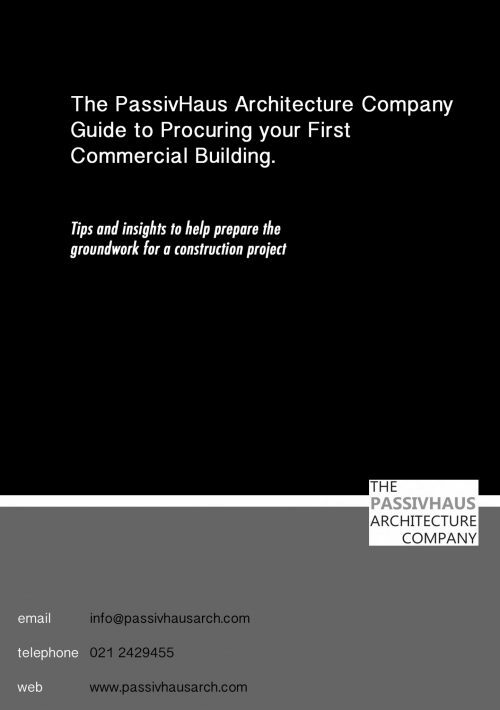 How does an architect communicate a design to a client in another country? 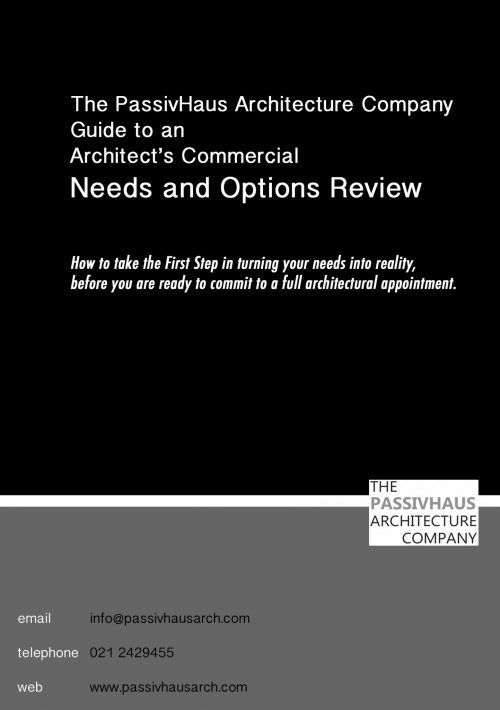 What is the cost difference between Passive House and Part L?